You can find CD's through Ebay or other online options but for a concentrated store where there focus is on Cajun / Zydeco I normally direct people to www.FloydsRecordShop.com. It's been around for ever and is located in Ville Platte, Louisiana... The other option could be www.LouisianaMusicFactory.com which is in New Orleans. The other reason why I like Floyds Record Shop as well as other sites is that you can play samples of the tunes before buying the CD. I wanted to put the word out to a great opportunity to do Zydeco tours. Kay with the Magical Mystery of Zydeco will get you into those unique experiences with a group of fellow fans. Check out her web site and upcoming trips planned. Her prices were also quite amazing considering what your getting. 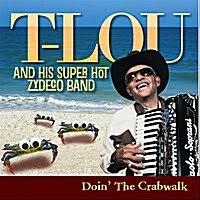 Zydeco CD Review - T-Lou "Doin' The Crabwalk"
Loved the cover of the CD as well giving it a little happy California Zydeco feeling with the image of him with a beach in the background. To listen and buy the CD just go to the following CD baby link..
One of the two partners who own the Zydeco Hall of Fame Bar (formerly Richard's Club), passes away after a fight with cancer. Here is an article about the club and Michael DeClouet as it talks about his generous energy he gave toward keeping the club alive. Prices are often cheap as I experienced as well. I got an Alamo car rental for eleven bucks a day and Motel 6 was thirty five a night. Other ways you can save a few bucks is to fly directly into Lafayette and stay at the Blue Moon Saloon where you can actually walk to the festival which is only a few blocks away. The other big plus is the festival is FREE.. Yep.. Unreal considering the level of talent that play from countries all around the world. While the main days of the festival are Saturday and Sunday you can come in a day or two early or stay an extra day as there are festival event artists both on Thursday and Friday. There are a ton of great Zydeco and Cajun bands that not only play at the festival, but play at surrounding locations incase you want to get away from the festival for a bit. I left the festival a little earlier on both Friday and Saturday nights as there were Zydeco bands (Jpaul and Keith Frank) at El Sido’s, a local bar about 10 minutes from the festival. The advantage of this festival is if your not a huge dancer, you have the best of both worlds as you can hang around with 90 percent of the crowd who are just watching the artists and not dancing. If the main reason your going there is dancing then you can dance at the festival and at the bars away from the festival. the Bay etc.. 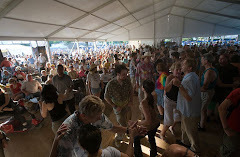 The ideal situation would be to bring a small group of dancers with you so you have enough dancers who you know in addition to dancing with the local Zydeco dancers. Here are a few experiences that you may get to enjoy while your in Louisiana..
4. Café Des Amis on Saturday morning for the Zydeco party. 5. Getting lost and asking for directions from a local resident. 6. Complete strangers coming up and talking to you. rated so high for tourism..
Also found out you can purchase his CD on iTunes! !